Collaboration software, starting with Lotus Notes, have mostly been structured into “groups”. A “group” is a gated pocket of information and tools, accessible only to members of that group. This structure is a reflection of how organizations are structured – into “divisions”, or “departments”, or “teams” or “offices”. Designing collaboration software this way is a massive improvement over the previous (and still persistent) generation of collaboration software – email. The email approach to information sharing is by its nature unstructured – every time you need to share something with someone, you simply create a new email and sent it out. It in no way distinguishes between people within a group, outside that group, or even outside the organization. However, in a company, a “group” is a coherent unit, with a defined purpose, with people who need to work together closely, often on repeat activities, sharing the same information much of the time (a Sales team accessing a standard contract form for example). It is massively inefficient to create a new email everytime you need to share information with a colleague. A “group” in the collaboration software provides a dedicated online environment to this closely knit unit of people to accomplish joint tasks – a team calendar to coordinate team schedules, project management functionality to schedule team activities, document folders to allow access to documents and so on. In addition, it also includes tools which are not purely task related, like motivational tools (displaying an exceptional performer for example) or tools relating to employee development (gathering employee feedback). Social collaboration – an alternative? But this approach is not without demerits. In a real business environment, although people within a group need to work together closely, they are not self-sustained or disconnected from the rest of the organization. These groups often need to work together with and access information from other groups – cross departmental teams for example, or have ad-doc collaboration needs (Sales needing a collateral document from Marketing, for example). 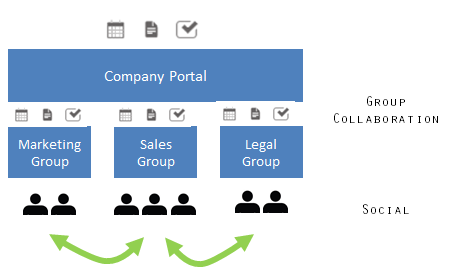 The “group” structure can sometimes be restrictive and siloed when it comes to these inter-group information flows. Social collaboration is a new approach, which combines elements of both email and group collaboration. On the one hand it spurs ad-hoc connections across the organization, but is also geared for groups of people – you can browse other people’s profiles, post messages, invite others to the conversation, attach documents etc. It seems to be suitable for modern organizations, where information freely flows across the organization, and temporary cross department teams often come together to complete projects. The best approach then, is not social collaboration OR group collaboration, but a combination of the two. Group collaboration tools allow closely knit teams to work together. Social tools layered over these collaboration tools allow team members to access information within their group, and share it with other groups, insofar as they have rights to that information.